This entry was posted in Freshly Made Sketches Challenge, Lots of Thanks, Project Life. Bookmark the permalink. Love these bright bold colors together! Super! This is so fun, Amy! I love the fun colors. You are too sweet for making awesome cards for your girls to hand out. This is a perfect card for saying thanks to what is obviously a valued principal. Your daughter is very sweet to want to do something and you made her the perfect card. Fabulous card Amy – love how you’ve used the PL card and your sentiment is the perfect one for your daughter’s principal! I love this card, Amy! 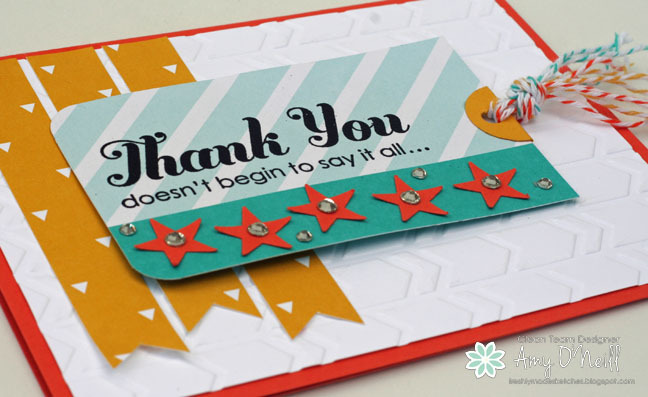 So bright and cheerful, and a fabulous way to say “thanks”. Another beautiful card, I like your cards very much! Perfect design, perfect sentiment!! I’m sure it will be cherished, Amy! Absolutely delightful! Love that you used all 3 colors of twine! This card is so lovely Amy and will be perfect for your daughter’s principal! I love the mix of colours! I always forget to use my Project Life cards (usually because I’m hoarding them for my albums!)! I love those sweet little stars and can’t wait to get that punch!